Gardening is a popular business around the world and, for many, finding the right services is vital to maintaining a healthy, beautiful garden. From the perspective of gardening service owners, this means ensuring maximum visibility. Few gardeners have a brick and mortar location – after all, your business is about going to a client’s garden – so a strong online presence is vital. The list really does go on, but the point should be clear. 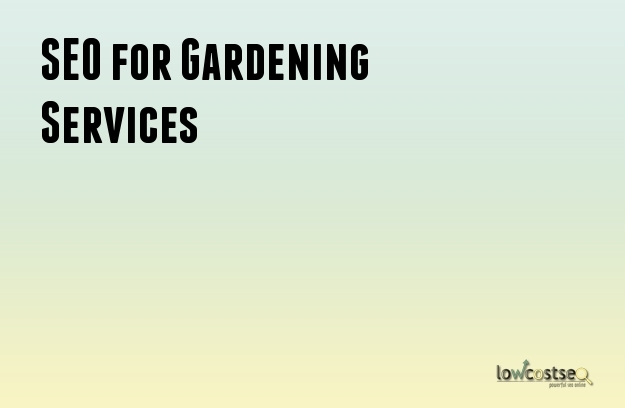 While there are big catch-all terms such as “gardening services”, you shouldn’t ignore the more specific terms. These aren’t just long-tail keywords – these represent users who are now looking for a specific service and are more likely to convert into customers. This is the traffic you want. This should be reflected in your website optimisation. Have specific pages for each service, so users can be directed to the correct landing page. This will give them what they want, giving you a lower bounce rate and a better chance of converting the user into a customer. Gardening is a very visual industry: people want visible results. Likewise, you need some visual appeal to entice new readers. Sure, your website should contain plenty of pictures and other visual media but you need to be more specific. If you’ve done any large or otherwise noteworthy projects, try using these as case studies and examples of your work. The main purpose here will be to visually showcase your talents. Yet, if you operate on a local scale, you may also be able to use this to your advantage. If you work on public spaces, then try contacting local papers and websites to cover the development. This increases exposure (building up a backlink profile) and, again, draws in the right attention. Different customers will require different services, so don’t be afraid to adapt your strategy. For example, many people will want their lawn cut, but people with smaller gardens aren’t going to have much use for professional landscaping. When building up your link profile or interacting with other publications, keep this in mind. Because each service has its own keywords and unique queries, you’re free to target each appropriately, ensuring people only land on relevant pages. Alongside this, you may want to consider some videos or tutorials. Depending on your services, you can talk about seasonal changes, such as when to plant new flowers or harvest crops, or even general landscaping and maintenance tips. These videos will serve another way to draw in attention – this time from the likes of social media and forums, as people share your advice to help each other out.